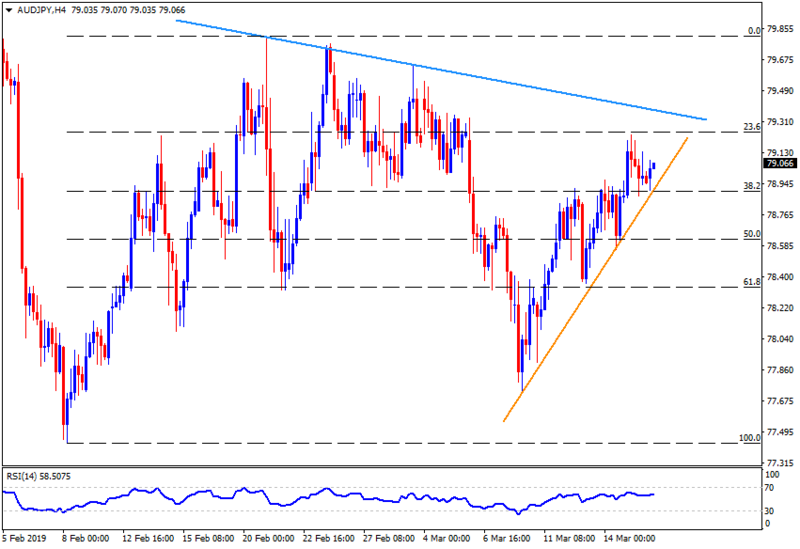 AUD/JPY took a U-turn from two-week-old ascending trendline as it trades near 79.10 during early Monday. 23.6% Fibonacci retracement of February 08 to 21 upside, at 79.30 acts as immediate resistance for the pair, a break of which can propel it to a descending resistance-line stretched since February 21 around 79.45. Assuming buyers’ ability to conquer 79.45, 79.60, 79.85 and 80.00 could flash in their radar. Meanwhile, a downside break of 78.90 support-line figure might drag the quote to 78.50, 78.30 and 78.00 consecutive supports. Additional downside under 78.00 can avail 77.70 and 77.40 as rest points.